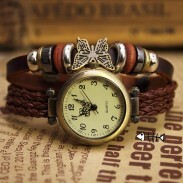 The Retro Butterfly Leather Bracelet Watches is Hand Knitting leather bracelet. This watch featuring its Bracelet. 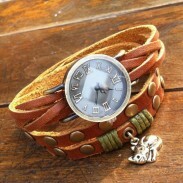 The bracelet is Hand Knitting leather bracelet. Soft. Adjustable. Beaded. 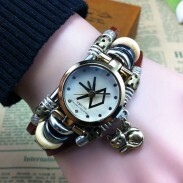 Metallic beautifly decorates the bracelet which makes the strap more cute. Round. 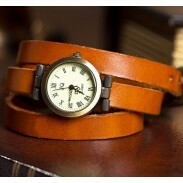 This watch is made to excellent standard. The quartz watch is firmly studded on the leather. Indicate the accurate time. 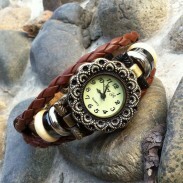 This watch is not only a watch but a sweet accessory. In it, you will look more elegant. Have one, it will navigate you to a fashion and sweet world. OMG! 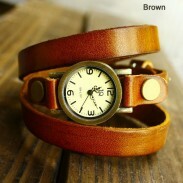 I love this watch.